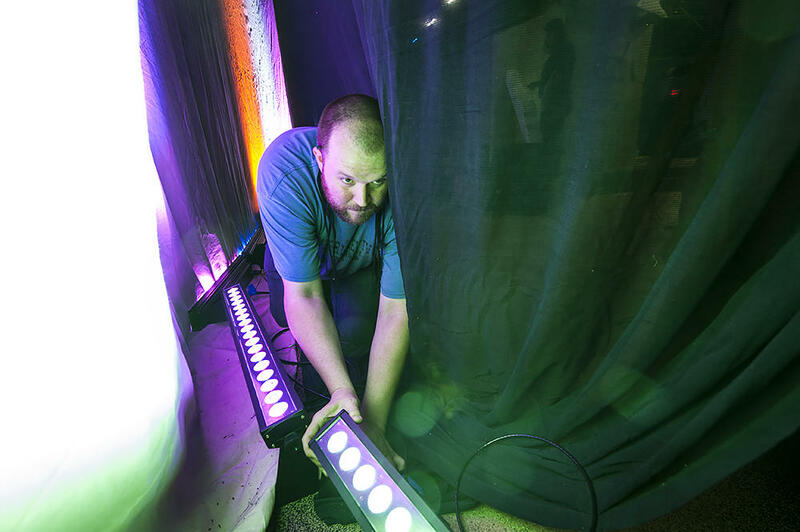 Stage Electrician Nick Uthoff works to position a set of LED lights behind a screen in preparation for 'The Ghosts of Lote Bravo' at Unicorn Theatre. Sound and lighting designers at Kansas City's Unicorn Theatre are pulling out all the stops for the world premiere of the play The Ghosts of Lote Bravo. Thanks to a six-figure grant, the Unicorn has been able to upgrade to the latest technology the theater world has to offer. About a week before the premiere of The Ghosts of Lote Bravo, the set was still a work in progress — styrofoam being carved into rock formations while lighting technicians crawled around the rafters like trained acrobats. But after nine years of hanging lights at the theater, Nick Uthoff was confident despite being 20 feet off the ground installing the last of the new equipment. Assistant Lighting Designer and Master Electrician Edward Hayo works with a Source Four LED light that is computerized to respond to commands. "This is the crown jewel," said Uthoff. "It shoots a beam of light that can change to any color and a pool of lights can move anywhere on stage. Now it's all done. We just have to point it where it goes. But the hard part's over. "Pointing it is the fun part. It's like sculpting with light." Imagine if all of your light fixtures at home were connected to computers and you could program into them an infinite number of colors. It's like the ultimate mood lighting of the 21st century. Such is now the case at the Unicorn, as a result of a $100,000 grant from the David Beals Charitable Trust of Bank of America. The funds were earmarked for a state-of-the-art lighting system and a powerful console to enhance sound and projection design. Uthoff said the new lights can be switched back and forth between the theater’s two stages. "There are more computer components inside of them, so they're heavier than the old lights but the standard design is the same. It's just a C-clamp you tighten with a wrench on pipes in the air," he said. "It's a lot of ladder climbing because it's a big old space. And running the cables in the right way — you've got to keep in mind the order. "It's a crazy science but it's our crazy science." Uthoff casts a large shadow as he moves behind the curtain backstage at the Unicorn Theatre. The Unicorn's resident lighting designer, Alex Perry, and resident artistic director Cynthia Levin are crazy about the new technology, which might have taken the theater 10 to 12 years to assemble were it not for the generous grant. "To some extent, we were falling behind from where that edge had been for the theatrical community," said Perry. "We do cutting-edge work, so getting our technology to be once again on that cutting edge was a huge benefit to the productions." Levin admitted there were shows in past seasons when she felt the limitations of the equipment she's now been able to retire. "I would say just about every show we've ever done, we've said, 'Man, if we only had this. If we only had x, we could do this'. Then the next show, it's 'If we only had y,'" Levin said. "What's been so successful at the Unicorn is that I surround myself with the smartest, most creative people that I know. So when we hit a block of, 'Ugh, there's no way to do this. We don't have the light. We don't have the speakers. We don't have the computers,' we find a way to do it. Because if there is a piece of technology that will do that for us, more power to us." Making micro adjustments, Uthoff is setting the scene for dramatic lighting changes during the course of the play. The differences between the old equipment and the new can get pretty technical. But Perry has a knack for boiling it down. "As a lighting designer, one of the biggest things to discuss would be the options of color. It used to be I would have to hang a single light for every area for every color," he said. "Now being able to just put up one light, I no longer have any restrictions in color. You're talking about the subtleties between different whites. It's an indefinite thing." The Ghosts of Lote Bravo is about a woman searching for her daughter, who’s gone missing in Juarez, Mexico, considered to be one of the most dangerous cities in North America. Levin said the various locations the characters find themselves in offered the perfect opportunity to take the upgrades to full throttle. "It's a huge, expansive show. It takes place in 15 different locations: in the desert, in the interior of a cantina, out in the street, inside a little house with only candlelights and no electric lights. What it calls for is what I'd call epic," she said. "So how can you possible create five hundred different looks with your regular lights? The idea that the LED lights can create many, many different looks is going to make this show magnificent." Perry said the upgrades offer infinite possibilities. "We're not stuck specifically with the colors of the rainbow," Perry adds. "We have every color between, every color you could possibly think of. I'd say 16 million colors. I'm not sure that's the number but that's what came to mind." "It's up to Alex (Perry) and the designers to know how to blend color now," adds Levin. "You have to be a painter. Think of that and all those colors they could blend. Van Gogh could get those incredible colors — a blend of all those other colors — and now we can do that." Levin said the new capabilities in sound design will also allow deep, multiple layers tones and textures. Gone are the days when the old console would get overtaxed, resulting in the most modern of frustrations: a computer crash. 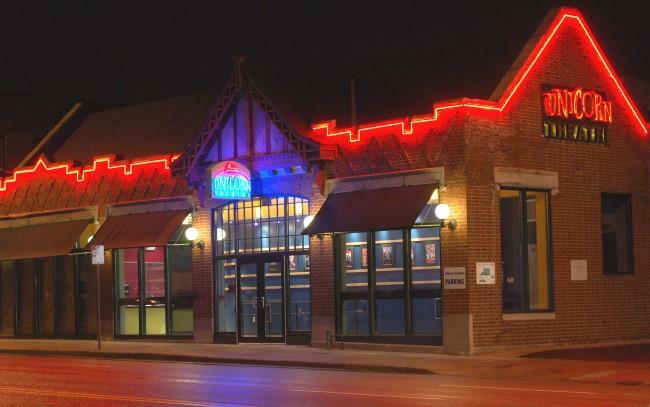 'The Ghosts of Lote Bravo' runs through May 8th at the Unicorn Theatre, 3828 Main Street, Kansas City, Missouri. 816-531-PLAY. Audiences at the Unicorn Theatre will see higher-tech productions thanks to a $100,000 grant, the theater has announced. The grant, from the David Beals Charitable Trust, will support technology upgrades in lighting, sound, projection and electrical systems. “We’re going to be able to do some things we couldn’t do before,” said Cynthia Levin, the Unicorn’s producing artistic director.